The alarm sings its wake up song. It’s time for me to get up, get dressed, and then wake up the kids so that they can get ready for school. I like this part of the day, as I get to kiss them on their cheeks (I’m a mom, it’s in my DNA). 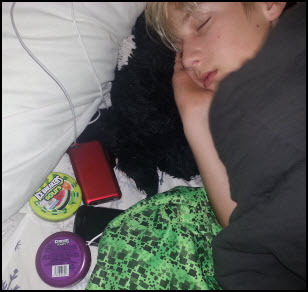 This morning I noticed that my son went to sleep with particular belongings surrounding him: Candy, iPod, jersey from a former soccer team, phone, and his Xbox controller. That’s a lot of important stuff! I mean, he’s got everything he needs right at his fingertips in the event of a Zombie Apocalypse. Next Next post: Nutcrackers, sweet!